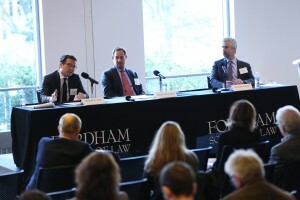 The first panel featured five international tax legal experts. The panelists discussed numerous topics such as: international profit shifting, reforming international tax treatises, taxing “where sold” vs. “where originated,” the Base Erosion Anti-Abuse Tax Provision (“BEAT”), the Global Intangible Low-Taxed Income (“GILTI”), the worldwide vs. territorial tax framework, and the reliability of U.S. Treasury Department tax guidelines clarifying the new allocation and deduction rules. The second panel featured practitioners with experience in policy, practice, and academia. These panelists discussed various issues such as: the weaknesses in the lack of earnings and profits test under GILTI, the current trend of aggressive taxation of foreign corporations, a comparison of the current international tax policy to the Obama Administration’s prior tax reform proposal, and a proposal to fix the “broken” international tax code. The Symposium concluded with closing remarks from Steven Dean, Vice Dean of Brooklyn Law School. Mr. Dean expressed his enthusiasm for the dynamic nature of tax law and policy and highlighted the many job opportunities that now exist in the tax field. These opportunities will only grow as experts continue to learn about the repercussions of the new international tax regime. When employees engage in misconduct and illegal activity in the workplace, whistleblowers must be encouraged to speak up. Whistleblowers protect the integrity of the U.S. financial system and ensure that employees adhere to ethical standards. But in doing so, whistleblowers may face backlash from their fellow colleagues, bosses, and upper management. As a result, legal protections must be in place to protect and support whistleblowers. This Symposium discussed one such safeguard taken up the U.S. Securities and Exchange Commission (“SEC”). This whistleblower program, which was authorized by Congress, allows the SEC to give monetary awards to those who report illegal conduct in their company. 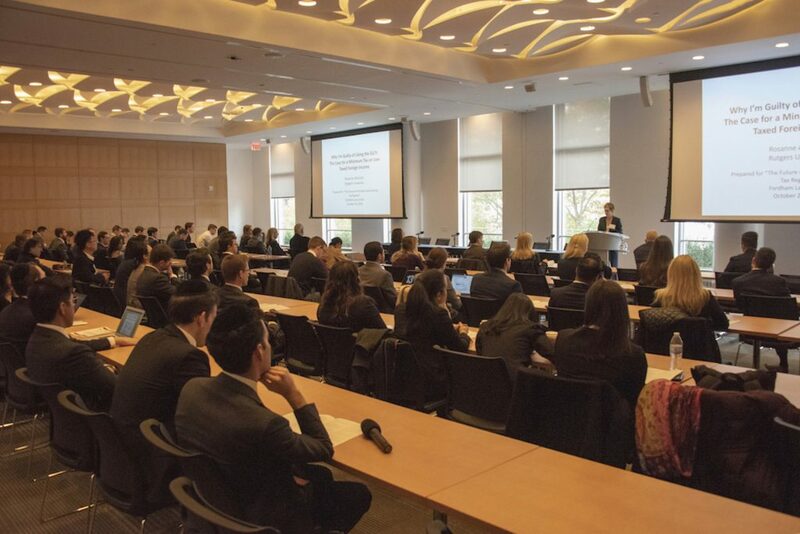 The Symposium featured a keynote speech from Ms. Jane Norberg, who heads the Office of the Whistleblower at the SEC, and included an in-depth panel discussion that addressed both the successes and the shortcomings of corporate whistleblowing. The panelists were drawn from a broad range of careers within the public and private sectors, and included SEC employees, private practitioners and law professors, each of whom brought a diverse perspective on contemporary whistleblowing. The tern political corruption broadly captures any abuse of entrusted power by government officials for private gain. As history demonstrates, the world has not been shortchanged of bad actors willing to facilitate corruption, particularly through the provision and receipt of bribes. The massive and odious problem of corruption is found in the U.S. and virtually every other nation in the world. Defining political corruption is complex and there are many competing viewpoints posited by scholars and professionals. The recent Supreme Court ruling in McDonnell v. United States significantly narrowed what qualifies as an “official act” by a public official in the U.S., curtailing the power of federal bribery laws. Corruption in political finance is also a growing concern in the U.S. as demonstrated by heightened scrutiny over political donations made by financial institutions and the ethical issues surrounding the Clinton Foundation. The severity of the problem extends and intensifies abroad. Since its passage, the Foreign Corrupt Practices Act of 1977 has evolved and significantly influenced corporate and business practices across the globe. Corruption was recently brought to the international forefront, implicating hundreds of high-profile private and public individuals and institutions, with the U.S. Department of Justice’s FIFA-related indictments alleging systemic and widespread corruption and the colossal Panama Papers data leak. This Symposium aimed to foster a meaningful dialogue concerning the history, present state, and future of federal and foreign anti-corruption and anti-bribery laws. Our panel of leading scholars and prominent practitioners assessed what the future holds for companies conducting business abroad and analyzed the effects of recent U.S. and international corruption rulings, investigations, and scandals. Inspired by the forthcoming book Getting Ready for the Next Bailouts (Columbia University Press, 2016) by Fordham Law Professor Richard Squire, this symposium examined the narrative of the recent U.S. financial crises, changes in the regulatory landscape, and facts and myths about bailouts and their role in the U.S. economy.